Price: 912.00 USD* / 1,156.00 CAD* / 850,00 EUR** (executed in sterling silver with sterling silver stone bezels) - Prices are indicative. 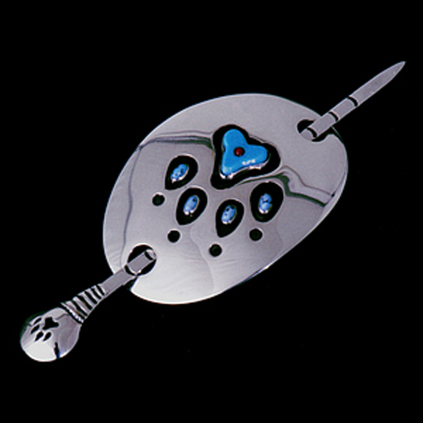 > SCROLL DOWN to read the traditional Ojibwe Anishinaabe story behind this hand-hammered sterling silver hair buckle. > Visit Zhaawano's Art Blog to read more about the symbolic meaning and the story behind the buckle. A long, long time ago, the earth was flooded. Wiisagejaak, the Crane Spirit, wasn’t too pleased with the flooded earth, so he called the muskrat to dive down to get a piece of land from the bottom of the sea. Muskrat, who was a brave animal and an expert diver, did as he was told and after he resurfaced with a tiny bit bit of soil in his paws, the Crane Spirit dried the mud obtained by the muskrat from the bottom of the flood waters. After he blew the dried soil they were suddenly on a big island the shape of a turtle. The next time the Crane Spirit blew the soil he couldn't see across or how big the island was. *The above is a free rendering of a Nakawē Ojibwe/Anishinini/Cree story linking Wolf to the creation of the world, told by George Peequaquat of northern Saskatchewan. It was respectfully taken from the book 'Bits of Dough, Twigs of Fire' by Nick Johnson.